In the next tutorial I will show you how to monitor a Mustek PowerMust 2012 UPS with Ubuntu Server 14. The UPS is connected to the server using a USB cable. This means that there is a problem with permissions, so we need to set the permission and then reboot. MONITOR [email protected] "Local UPS"
This guide works also with a SOCOMEC NET0600-PE UPS. This would increment all the way to device number 61. I suspect this could also be causing my RPi to reboot without reason. Change cable / USB port first. 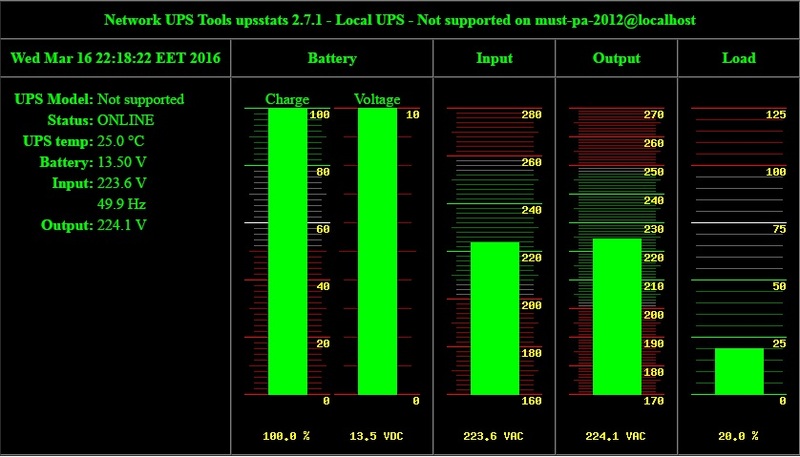 Test the UPS with a normal PC connected to the USB. into /etc/rc.local, now those messages only occur 6-7 times before the service is started. I solved the problem by increasing the “pollinterval” setting in /etc/nut/ups.conf to 5 (from the default of 2) thereby allowing more time for the UPS to reply when polled.